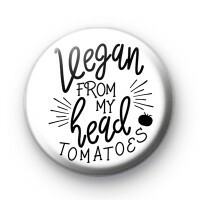 This 25mm pin badge has Vegan From My Head Tomatoes written in a lovely font. It is a fun, tongue in cheek Vegan badge and one that makes us smile every time we make it. We have so many Vegan badges in the shop so if you'd like a few more designs, make sure to take a look at those too. Ideal if you're a big supporter of a Vegan lifestyle and are a proud member of the community. Veganism is a way of life, not just a diet.